Since the last time I was in The City of Angels i.e. Bangkok in early 1991, the city has almost tripled in size. There are numerous modern high-rises dotting the landscape where single or two-story buildings used to be. There are also now new peripheral and elevated roads that attempt to alleviate the constant traffic in the city. There are a dozen or so new five-star hotels, in addition to the 5 that were in place when I was last there. 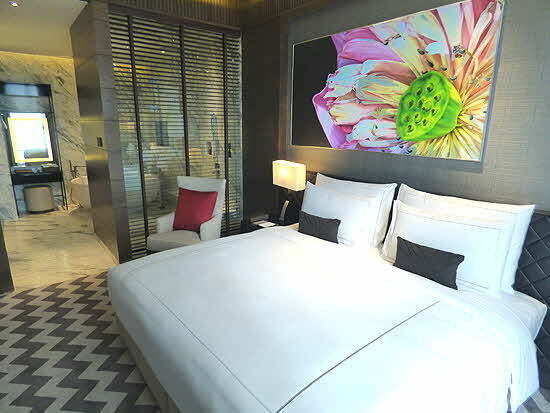 Many of these hotels and numerous upscale shopping malls are located along the shores of the Chao Phraya River that bisects the capital, but a number of the newer builds are in the heart of the city. One of the newest properties is the 137 Pillars Suites and Residences, a luxury property that is associated with the 137 Pillars House, a historic building in Chiang Mai that belongs to the same owners. The 137 Pillars House in Chiang Mai relates to the early history of Siam (as Thailand used to be called). It is associated with the family of Anna Leonowens, the famous “I”� in the Rodgers and Hammerstein's musical “The King and I”��. The “King and I” story is based on a series of autobiographical stories written by Anna Leonowens and the king was Mongkut, now posthumously called Rama IV, King of Siam (ruled 1851- 1868). It is notable to point that the famous 1956 film, starring Deborah Kerr and Yul Brynner, was banned in Thailand as it was at the time perceived to portray the interaction of the king and Anna as being discourteous to the monarch! The Suites and Residences is in one of the centrally located high-rises and it has both a residential section for long term occupancy that enjoys all the amenities available to the hotel guests, and a hotel section with spacious suites. 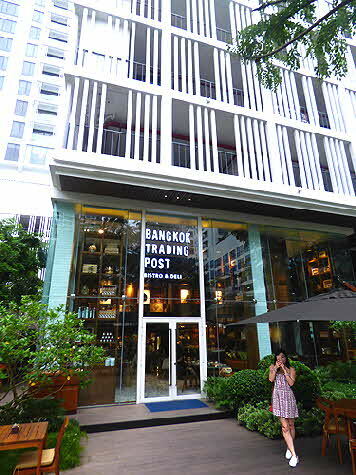 There is a lovely rooftop pool and indoor and outdoor rooftop restaurant and bar as well as a garden level bistro called “Bangkok Trading Post”. Very nice Spa facilities and Fitness Center. 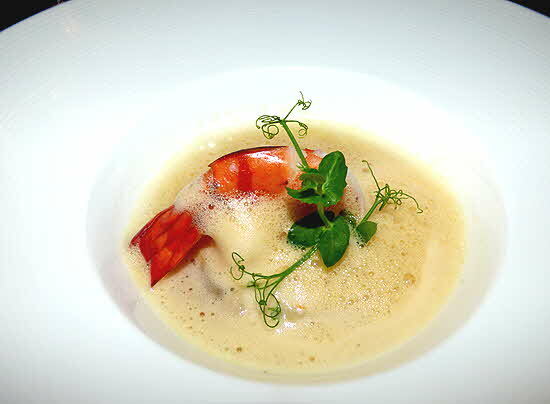 It also has a restaurant kitchen that can create Michelin-star level meals. I should also mention that 137 Pillars Suites and Residences is a member of the Small Luxury Hotels www.slh.com/hotels/137-pillars-suites-residences/. 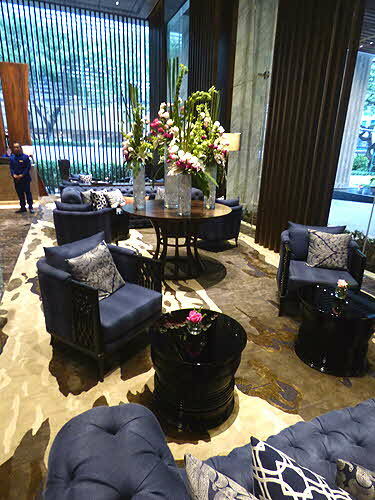 On arrival from the airport, we were greeted by the General Manager Mr. Bjorn R. Richardson and whisked to the 26th floor where the Leonowens Club is located. The Club is the suites lounge and registration. 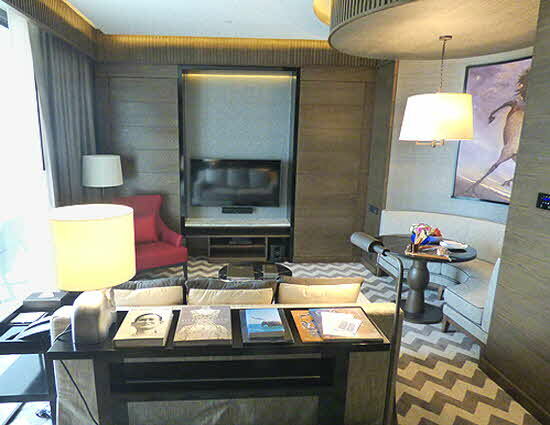 My suite 2505, at the 25th floor, had everything an international traveler that stays in five-star hotels expects and more. 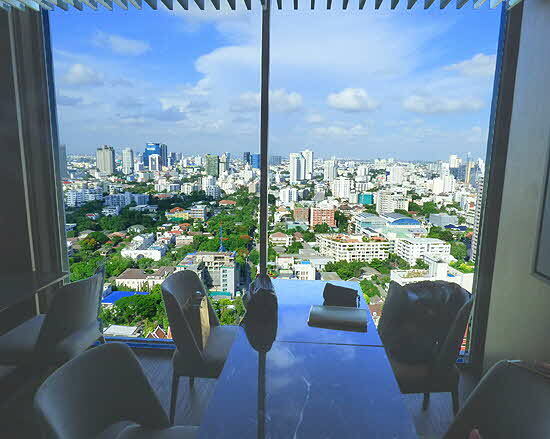 There was a spacious living room with a couch and a semi-circular banquette, an armchair, large flat screen television, refrigerator bar and many occasional tables; it opened to a balcony with armchairs and a table, overlooking the city. On the table in front of the semi-circular banquette, there was a large welcome fruit basket and a tray of delicacies. 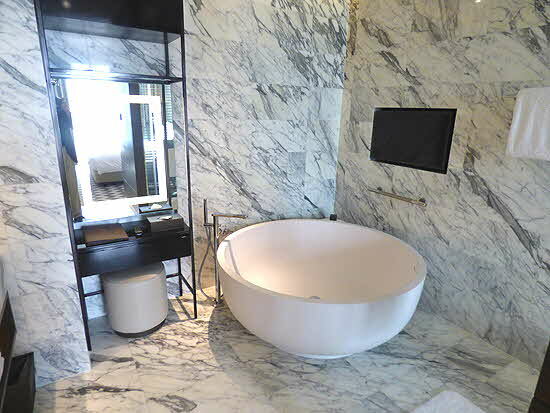 The lavish marble-tilled bathroom with bowl-bathtub and separate shower stall had a flat-screen television, plush terrycloth towels, a pair of bathrobes and slippers, an exceptional amenities package and, of all the automation marvels now available in high-end hotels... a Toto automatic toilet that lifted its cover, turned on a discreet light and gurgled invitingly every time one passed in front of its stall! There was a dressing room between the living room and bedroom with floor-to-ceiling mirrors and ample wardrobe sections where the safe was also located and that was where my suitcase was waiting for me, delivered upstairs from the airport car upon arrival. The bedroom had a California king bed with high-thread-count sheets. There was also an armchair, night stands, a modern �tag�re and a large screen television on the wall facing the bed. 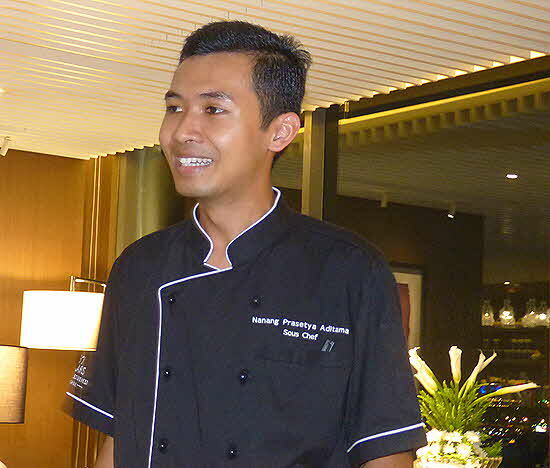 Of great interest to me was dinner created by sous chef Nanang Prasetya Aditama. He is a young man, only 26, yet he has an exemplary sophisticated palate and culinary expertise. Three of the seven dishes he presented were dazzling twists on traditional dishes -- two Thai and one Scandinavian -- that I really enjoyed. I cook at home a traditional version of Spicy Tom Yam Kung; a clear, lemongrass and kaffirlime infused delight, made with chicken stock, fish sauce, pounded bird’s eye chilies, prawns and sliced mushrooms. His Spicy Tom Yum Goong hot and sour soup was even more fragrant, a bit spicier and so much superior. 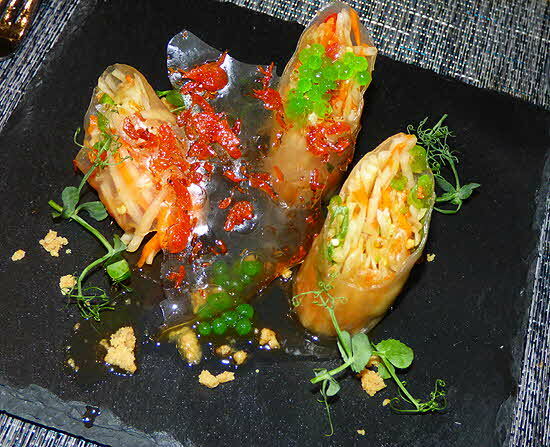 His Twist on Som Tum Thay, using papaya, rice paper, green beans, Heirloom Tomatoes, Peanut oil, Shrimp Feather and Lime Caviar made for an exceptional appetizer. Here were a couple bites of Thai summer, sweet and tangy and crunchy. Could not have enough of it. 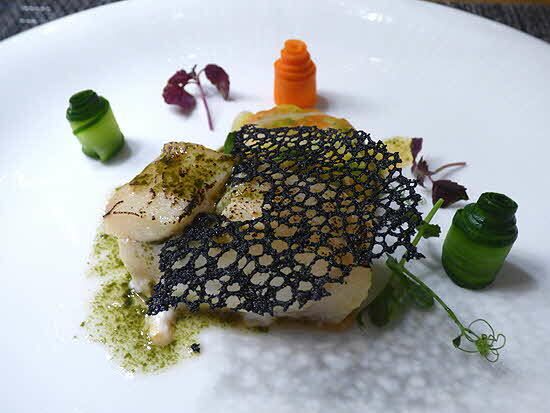 And his award-winning main course, Sous Vide Nordic Snow Cod Fillet was a twist on a classic Scandinavian Poached Cod recipe. Here the cod was cooked in vacuum (sous vide) using Sweet Miso, Hajikami Ginger, Dashi Broth and Poached Romanesco Kyabetsu. The vacuum cooking makes the flesh silky and the flavors of the liquid ingredients permeate the fish making each bite a taste discovery. Pure delight. Returning to Bangkok was a real pleasure. The city has grown and expanded without loosing the charm that its residents exude when meeting a foreigner. I would love to come back some time in the near future for a longer visit.